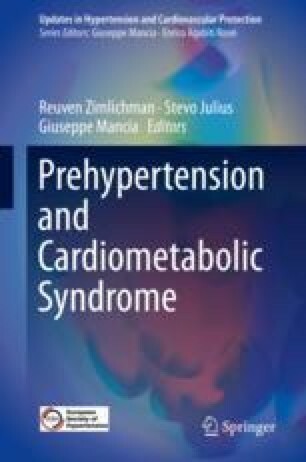 Subjects with prehypertension, defined as office systolic BP (SBP) between 120 and 139 mmHg or diastolic BP (DBP) between 80 and 90 mmHg, as compared to normotensives (BP < 120/80 mmHg) are at increased risk of developing sustained hypertension and an excess number of cardiovascular (CV) events. In the setting of prehypertension, the ambulatory blood pressure monitoring (ABPM) plays a decisive role, because the average of BP values recorded throughout the 24 h often fall in the range of true hypertension (24-h average BP > 130/80 mmHg). This phenomenon, named “masked hypertension”, could in part explain the increased CV risk observed in these patients. Within the range of prehypertension, the risk of having masked hypertension increases at increasing values of BP. Usually, pharmacologic treatment in prehypertensives with masked hypertension is not recommended, because the choice to start antihypertensive drugs is based on office BP values. However, patients with prehypertension and associated masked hypertension more frequently develop target organ damage and adverse CV outcome. Therefore, these subjects could reasonably benefit from drug treatment to reduce their overall CV risk. However, to date, there is no substantive evidence, either on intermediate outcomes or on hard endpoints, supporting the efficacy of drug treatment for masked hypertension. National Institute for Health and Clinical Excellence (NICE). Hypertension. The clinical management of primary hypertension in adults. Clinical Guideline. 2011;127. www.nice.org.uk/guidance/CG127.